For Kim Yo-han, a 32-year-old office worker in Seoul, November has always been the month to shop for products with big discounts offered on e-commerce websites. From high-tech gadgets to designer clothes from luxury brands, Korean e-commerce companies run up to 80 percent discount promotions this month, mimicking Black Friday in US and Singles Day in China. Limited price flash deals usually lead to a huge increase in sales and traffic, creating buzz among online shoppers. “I had to refresh the mobile app page to click the purchase button. Not even five minutes later, I saw a screen saying sold-out, which I thought was an error,” said Kim. 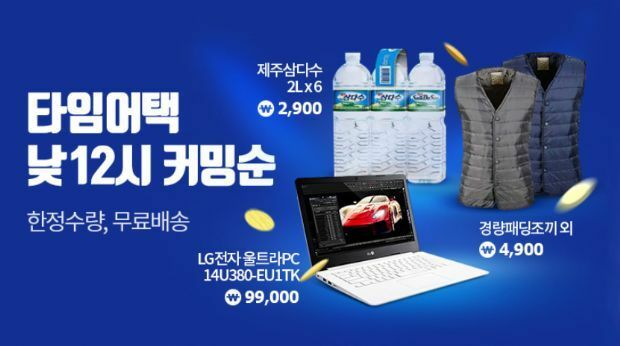 E-commerce company Tmon earlier this month offered a flash promotion deal on an LG Electronics laptop at 99,000 won ($88), just 22 percent of the actual price. The three-hour flash deal attracted thousands of online shoppers. However, the products sold out in less than three minutes because there were only 10 in stock. “Tmon’s promotion mocked customers. It was an exaggerated, false advertisement,” he added. 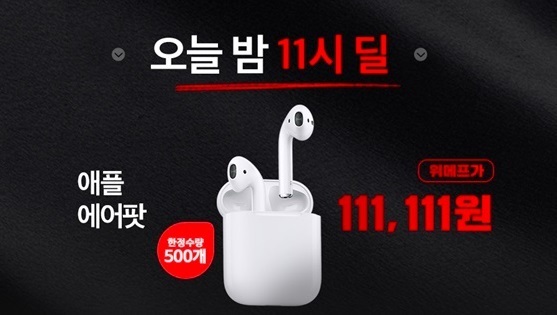 Another e-commerce company, WeMakePrice, came under fire after its limited 50 percent discount for Apple’s Airpod went viral online. Customers flocked to the shopping page but most of them failed to get one, as the server went down and errors kept happening at the purchase page. Customer complaints ensued, and there was even an online petition asking Cheong Wa Dae to investigate WeMakePrice’s “fabricated” advertisement. 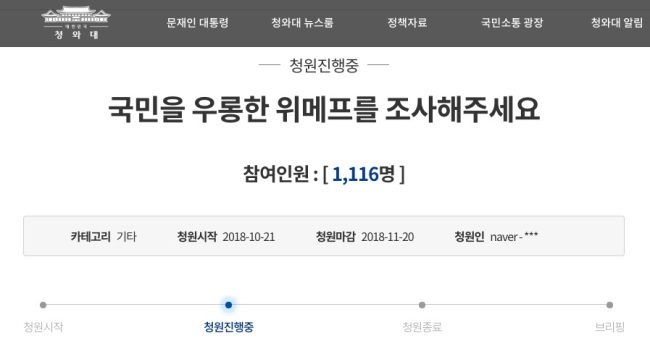 Over 1,110 people have signed the petition since Oct. 21, casting doubt on whether the company actually sold the product. In response, WeMakePrice released a list of purchasers of Airpods via its flash deal. The company also said it would prepare at least 100 to thousands of stock of each item for future flash deals. Industry insiders said some companies’ lack of preparation for discount promotions can lead to consumer distrust. “Sales promotion can be an opportunity for e-commerce companies as it can attract thousands of consumers in a few hours or even minutes, but it can also become a risk when customers have to go through an unpleasant and disappointing shopping experience,” said an industry insider. Another industry insider said that it is impossible for companies to prepare stocks of products in bulk when it comes to such sales promotions. “It is impossible for vendors to sell Airpods at a 50 percent discount. Such deals are only possible when the e-commerce company purchases them in advance and resells them at lower prices to make its promotion go viral and increase server traffic,” an official from a local e-commerce company told The Korea Herald. Many e-commerce companies do not reveal the number of available stock for sales promotions. E-bay Korea, an operator of online malls G-market and Auction, has been running its biggest sales promotion of the year since early November. Popular products like Sony’s Play Station 4 appeared in special price deals, but customers had difficulties purchasing such products. “Without knowing how many (products) are left, it is very annoying to keep seeing pages like ‘not found,’ or ‘sold out,’ when the company is still aggressively advertising the special deal,” said a customer who failed to purchase the product.